← A voice of reason, in unreasonable times . . . Following the armistice, and despite claims of victory, the Great War left a residue of exhaustion, trauma, and devastation in its wake. 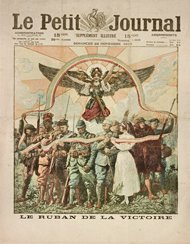 Images in the current GRI exhibition World War I: War of Images, Images of War, including Louis Charles Bombled’s The Ribbon of Victory, showcase the mixed emotions of the participating nations after the war’s close. As a whole, the show examines the representation of war in propaganda and the depiction of war by artists who experienced the brutality firsthand. We are pleased to bring you this information with the compliments of The Getty Research Institute. Please note: Experts lead gallery tours Tuesdays and Thursdays at 2:00 p.m. through April 16, 2015, with the exception of March 3 and April 7, 2015.